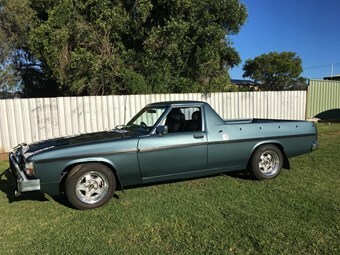 Holden's WB utes ran off the line from 1981 to 1984 and were part of a range that sold alongside the Commodore, and included utiltiies, vans, a cab chassis and of course the Statesman. Apparently plans were quite advanced to run a sedan and station wagon alongside the Commodore as well, but they were scrapped. In any case, the WBs are becoming prized posssesions for many, representing as they do the last of the big Kingswood-based fleet. Engine packages were primarity the 202 six and 253 V8, though you could order a 308 V8. Transmission offerings were three or four-speed manuals or a three speed auto. This example is a mildly modded 308 wih auto and seems to come with a long list of extras, such as four-wheel disc brakes. If it's as good as it sounds, this NSW car would be a very nice thing. It's priced at $23,000.